In my last article in this series, I stated, “Instilling truth into a child’s heart depends completely on how prepared his/her heart is to receive truth.” Therefore, my next six articles in this series will focus on practical ways to cultivate a child’s heart for truth. I will be basing everything I discuss in this cultivating section of the series upon the previous methods I have shared in the earlier articles of this parenting anger series. My prayer is as we slowly work through each of these steps, you will find how practical and healing God’s way of handling our parenting anger can be when we use it towards building godly character in our children. Also, as you apply each of these cultivating steps, you will see how they work to bridge relational gaps that parenting anger may have created in your home. So, we start with ourselves: parental integrity. 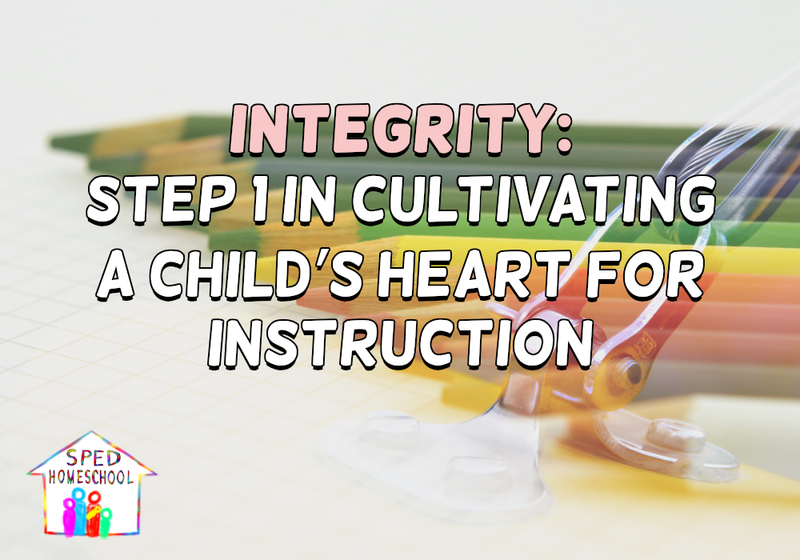 The reason I start with integrity is because a child only accepts a parent’s instruction as much as they can trust that parent. Also, integrity is essential in breaking the protective crust a child builds up when situations have trained them to distrust…which often happens when a child lives with a parent who has a short fuse. If a child can trust their parent, they will gladly absorb what that parent has to teach. Everything we teach our children hinges upon how much they trust us. If we fail to work on this basic foundation of our relationship with our child, much of our homeschooling and parenting instruction will be for naught. We are also more likely to see our children look to other places for truth instead of looking to us. Over time the relationships we were hoping to so tightly control with our misdirected anger will be the first things we lose the ability to influence. A person of integrity is someone who can be trusted to do what they say they are going to do. They are not someone who uses excuses and their actions and lives are aligned with the priorities they say they value. Day in and day out, no matter what, a person with integrity can be trusted. This doesn’t mean they are perfect, but it does mean they are really trying all the time. Let me ask you, is this how your children see you? Do you live in a manner consistent with your public persona? Or, do you change your character once you get behind closed doors or within the safe sanctuary of your home and family? Children will determine how trustworthy their parents are based on what they see them do and how they live either according to their word or apart from it. What a parent says about who they are holds very little weight if it differs from how their child sees them behave. I admit that as a young parent I did a very poor job of establishing integrity with my children. My anger was the biggest obstacle to developing integrity with my children because while I would tell them I loved them, I would not act in accordance with my words when I blew my top. As I started sorting out my anger issues, I decided to make a concerted effort to build up my integrity in the eyes of my children. To do this, I first created a mantra, “I love you no matter what.” And then I lived it out, by God’s grace, one day at a time…praying a lot along the way. I followed the process of taking steps to work through my anger episodes just as I talked about in the previous articles in this series (see the listing below at the bottom of this article). I wish I could say my son started believing me right away, but it took months of repeating this cycle and him testing the boundaries of my ability to act towards him just as I said I would. But, then the day came and the memory of this transformation in his heart still brings tears to my eyes. It was a beautiful summer day and we were outside playing in the yard when my son again tested my integrity boundaries. I can’t even remember what he did, but what I do remember was what he did and said after I told him, “I love you no matter what,” and followed through with my anger in check. He put his chubby hands on his hips and looked straight into my eyes and said to me, “You really mean it don’t you?” From that day on things started to change in how I was able to speak into my son’s life. No, he didn’t stop testing my boundaries, but he did start trusting me. I encourage you if you feel like all hope is lost with your children because of your past inability to handle your anger, there is a way to repair those relational gaps and instilling integrity is the first step in the healing process. Next time I am going to talk about authority and how to practically work on establishing a godly form of authority in your home that will strengthen the integrity bridge you are working on. Until then please make sure to connect with us at SPED Homeschool on our weekly live Facebook broadcast, in our support group, or by emailing us with any questions you would like to have us help you walk through as you homeschool your child with special educational needs.